Plastic bumper repair is a reality of driving automobiles, vans and S.U.V.s. When your plastic bumper gets scuffed, dented, or cracked, it looks bad…really bad. Plastic bumper repair is one of the most needed and appreciated auto body repair services we offer. Drivers are usually unaware of how affordable it is to repair a plastic bumper. 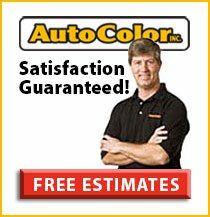 Auto Color provides plastic bumper repair services for every make and model of car. Bring in your scuff, dent or crack, and you may be surprised at how little your repair costs. Dented, cracked and scratched bumper repair is our specialty. Plastic bumper repair techniques can fix most damage occurring in day to day use. Auto Color’s exclusive processes focus on only the damaged areas without having to replace an entire plastic bumper. The repair cost is often less than an insurance deductible. So, instead of paying the replacement price for a new bumper, call Auto Color for your plastic bumper repair -most plastic bumper repairs range from $90-$450. Call now to help your car to look the best it can.